In this pair drill students take turns telling each other what the people indicated are doing using the present progressive. To use this activity, print enough copies for 1/2 of your largest class. Cut each page in half. 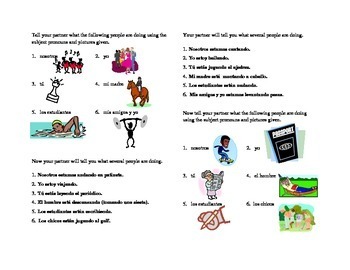 Put students in pairs giving each person in the pair half of the sheet. When students get to the bottom of the sheet, they switch papers and do the drill again. In my classroom, students must repeat the drill until they are instructed to stop. 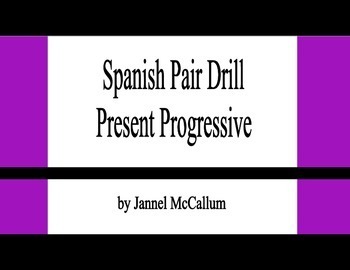 This pair drill is included in my bundle of Spanish I Pair Drills.